Nutritional Psychology (NP) is the field of how cognitive choices influence nutrition, psychological health, and overall health. 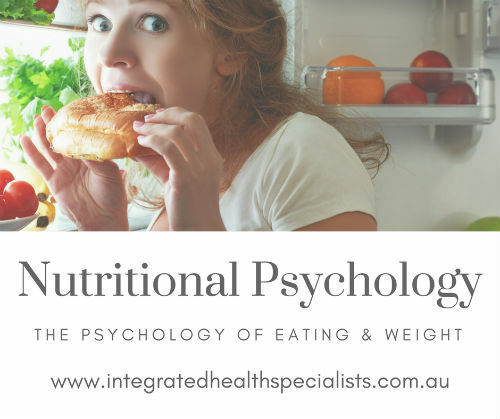 Nutritional psychology seeks to understand the relationship between nutritional behaviour, eating, weight management and mental health. What role does psychology play in weight management? Well let me ask you this; do you often find yourself eating when you’re not actually hungry? Or do you use food as a source of comfort when you’re feeling depressed, sad, anxious, or bored? Most people don’t realise the extent to which our feelings can impact our eating habits. An occasional binge may seem harmless, but emotional eating can escalate into serious health and weight issues, and can become very difficult to control. Most weight loss programs focus on diet and exercise but they often overlook what is the most potent weight loss weapon: your mind! Understanding the connections between your thoughts, emotions and your eating patterns and behaviours, will start to reveal some important insights necessary to manage your weight effectively. Becoming aware that emotional eating and binge eating may be a major contributor to your weight issues is a great start. If this is the case, you now need to find constructive ways to cope with your issues in ways that don’t involve seeking comfort through food, if you want to achieve long-term results. And guess what? Diets are NOT part of the answer! Research and evidence clearly shows that no matter what your weight is; diets and deprivation actually make you hungry and create powerful cravings for the very foods you are trying to avoid! Diets also do not address the causes and triggers of emotional eating, and the psychological components of the eating behaviours leading to weight issues. There are so many scientifically proven connections between emotional stress, digestion, metabolism, weight, and health. Research has also shown that chronic depression and anxiety tend to cause emotional eating, and people experiencing these emotional states are especially prone to crave sweet and fatty foods (Krauchi, Reich & Wirz-Justice 1997; Oliver, Wardle & Gibson 2000; Dallman et al. 2003). Deeper emotional issues and past traumas can also be underlying reasons for weight gain. Unconsciously, a layer of fat on the body may serve to prevent other people from getting too close (Greeson 1993). People can often harbor unresolved issues well into midlife and beyond, and unconsciously strive to remain “fat-protected” and as a result future weight loss efforts can seem futile. Most experts agree that overeating and weight gain is a stress-induced response that directly affects your hormones and your metabolism. CHECK OUT WEIGHT LOSS PROGRAMS NOW!